Detroit circa 1910. 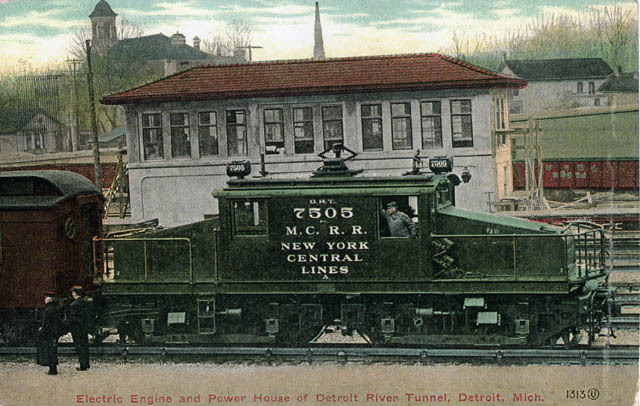 "Detroit River Tunnel, Michigan Central R.R." 8x10 inch dry plate glass negative, Detroit Publishing Company. View full size. Submitted by Rockysmycat on Sat, 08/12/2017 - 8:09am. 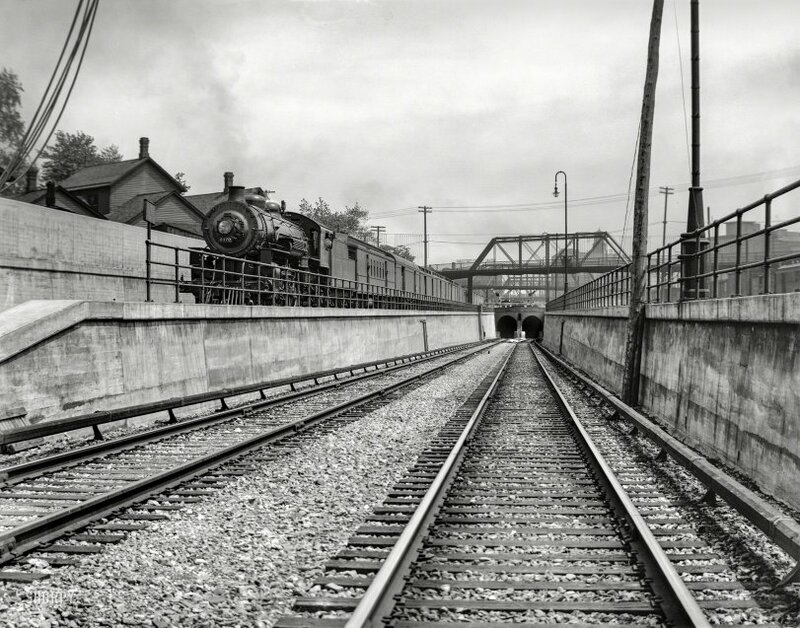 Wondering if the locomotive is shoving the cars toward the old station. The fireman is leaning out the window quite a bit and facing the rear of the train. Submitted by Ice gang on Thu, 08/10/2017 - 4:17pm. for Canadians is to ask what direction you go if you leave Windsor and go to Detroit? 99% will say south, of course. Submitted by racenviper on Thu, 08/10/2017 - 11:04am. Submitted by Tobacconist on Thu, 08/10/2017 - 10:25am. 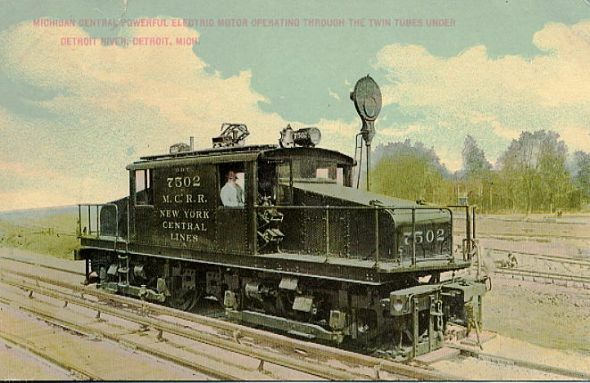 Here's a period postcard showing the sliding pickup shoes, and below that another example with a bonus shot of the Detroit River Tunnel power house. Submitted by TheGeezer on Thu, 08/10/2017 - 9:35am. The third rail on the right side of the track is the electric power feed for the engines. I'd like to know how the shoe contacted it. The only pictures I could find didn't show the shoe. Submitted by joegeds on Thu, 08/10/2017 - 6:25am. Fun fact of the day is that while this view is from Detroit heading into Windsor, the photographer is actually facing South as Windsor is actually South of Detroit across the river. There are currently 3 crossings connecting Windsor and Detroit: The Ambassador Bridge, the Detroit-Windsor car tunnel, and the Detroit River Rail tunnel. However, a new bridge is being built that will be called the Gordie Howe International Bridge, or The Gordie for short. It has a completion date set for 2022 and will cost between 1 and 2 billion dollars. Submitted by CCZ on Wed, 08/09/2017 - 3:33pm. 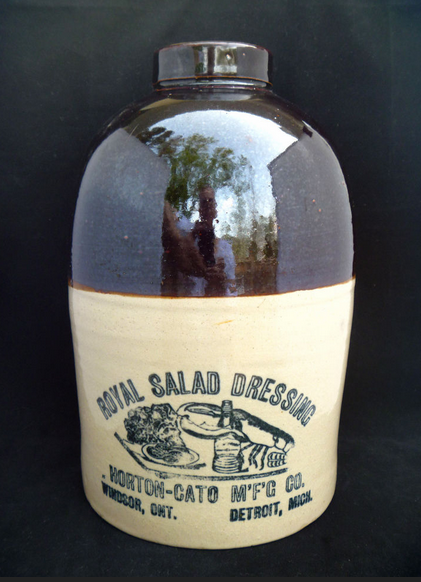 The tunnel certainly made getting Royal Salad Dressing (overhead sign behind truss bridge) to both sides of the river.